JOHANNESBURG/MBABANE, Aug 18 2013 (IPS) - Experts are agreed that the key to unlocking the economic potential of the Southern African Development Community lies in easing cross-border flows of people, goods, capital and services. But even if border restrictions can be lifted, a lot more needs to be done in terms of enhancing road, rail, electricity supply and other infrastructure within the region. Chief executive officer of consultancy Africa @ Work, Dianna Games, told IPS that while moves are being made to bring down physical barriers to cross-frontier movement, informal barriers are often replacing them. “As tariff barriers have gone down, there has been a mushrooming of non-tariff barriers – leading to delays at border posts and inefficient border posts, with the worst being the Beit Bridge border crossing between South Africa and Zimbabwe,” she said. Even Swaziland’s cross-border traders say they are barely able to make ends meet because of the high taxes and customs duties that they have to pay to import goods through the southern African nation’s border posts. While the Swaziland Revenue Authority (SRA) charges 14 percent value added tax (VAT) for goods from South Africa, a different formula applies to those imported from Mozambique. 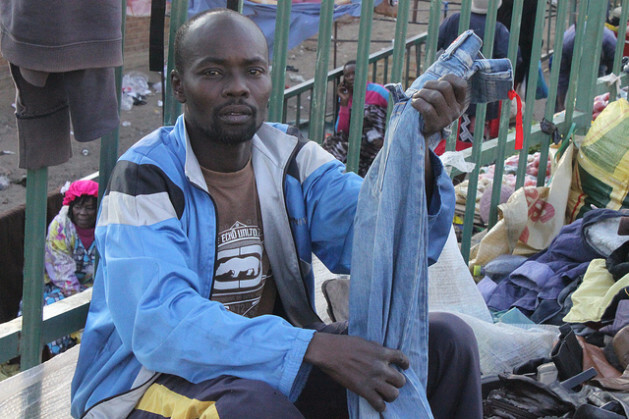 Dudu Fakudze sells second-hand clothing in the Swazi capital of Mbabane and goes to Mozambique every week to purchase stock. “It’s always frustrating to bring in stock from Mozambique because the customs officials do not consider the value at which you bought the item,” Fakudze told IPS. SRA communications director Vusi Dlamini admitted that importers pay more for goods from Mozambique compared to those from South Africa. He attributed this to the fact that Mozambique is not part of the Southern African Customs Union (SACU), which Swaziland is part of, along with South Africa, Namibia, Lesotho and Botswana. Dlamini said that according to the Harmonised Tariff Book used by all SACU countries, second-hand clothing from countries that are not part of SACU should be charged at E25/kg (2.50 dollars/kg) in custom duties plus 14 percent VAT. Goods imported from SACU countries are only charged 14 percent VAT. But he said it appeared that the application of this provision for non-SACU countries would throw the traders out of business. “After much engagement with hawkers’ representative, it was decided that a flat rate which provides for both customs duties and import VAT be used for a range of commonly-imported goods,” he said. Dr. Rose Phillips, the South Africa-based chief executive officer of management consultancy Accenture, stressed the importance of SADC countries working together to tackle the region’s challenges through agreements between governments. “They are key in promoting and facilitating the creation of new industry opportunities given, for example, that Angola and Nigeria are experiencing the highest growth rates in Africa,” she told IPS. She said that more facilitation of trade and less reliance on aid was needed to accelerate sustainable economic development on the continent. She stressed the need for more focused investment in the building and the maintenance of infrastructure, such roads, information and communications technology, rail, water and power supply. And she also supported the SADC focus on developmental corridors. “I personally support the creation of bodies that are dedicated and linked to certain infrastructural projects, as they can help manage all aspects of the completion of such projects – along with funding management and the inclusion of the private sector in public-private partnership structures. “This all seems to suggest regional authorities should create some suitable body such as the Maputo Development Corridor Board, but with an expanded executive mandate from the start – to work in partnership with all stakeholders and help mobilise as well as manage funding,” Mare said. Phillips stressed that the opening up of Africa cannot just be left to governments. “The private sector plays a vital role,” she argued. Phillips said that the development of Africa required more than money, and that people are crucial, with human capital a key resource for African development. “As more and more highly-educated Africans are coming home and our talent investment is bearing fruit, we are capitalising on the melting pot of talent that is uniquely African; diverse by nature, education, experience and viewpoint, and innovative by implication,” she stated.